For those of you that are using an Android device and would like to place a few bets on the Tote website, you should know that a mobile app doesn’t exist for Android users. However, Tote online is available through the mobile site version. There is no need to download and install any .apk file. The only requirement is to open your mobile browser and load The Tote’s website. The Tote mobile version for Android will provide safe and secure betting on all Tote horse racing pools within Ireland and the UK as well as give bettors access to their exclusive live betting feature. The Android mobile site also impresses with most of the desktop features, giving customers a more convenient and faster betting experience. Besides, bettors can look forward to placing wagers on all Irish Tote pools and choose from an assortment of betting types, including Pick 6, Placepot, Jackpot, Daily Double, Trifecta, Exacta, Each Way, Place, and Win straight from their Android mobile devices. The mobile version also allows for placing bets on selected United Kingdom pools with betting types such as Jackpot, Placepot, Trifecta, Exacta, Each Way, Place, and Win. It will also give bettors access to live Tote prices, special bonuses and promotions for those placing bets directly through the mobile website, and access to view your account history. The Tote mobile app for iOS provides a comprehensive betting experience for all your Irish and UK horse racing needs. Punters can also look forward to placing bets on a wide selection of greyhound racing as well as several major football matches throughout the year. The user interface of the iOS mobile app is beautifully presented with easy navigation, allowing bettors to quickly find all results and upcoming events in a matter of seconds. Listed at the top of the mobile app are various categories, including horse racing, greyhound racing, football, and daily guarantees. You will also find rollovers for the day posted on the homepage of the mobile app, followed by daily races along with guaranteed prize pools and betting types. The mobile app for iOS further impresses with both fixtures and results and will allow you to search for horse racing events with the help of several filters, including racecourses and the country in which the horse race is taking place. The mobile app will also keep you informed on all upcoming events and provide the latest news to give you an edge before you place your next bet on the races. Aside from this, the Tote mobile app for iOS even comes equipped with guides to explain each betting type, ensuring you understand each of them, especially if you are new to the world of horse racing. Located in the top left-hand corner are additional features, such as account information, banking options, mobile app settings, and more. Your betting slip will always be located at the bottom of the page and can be expanded by a simple arrow in the right-hand corner. Once you are satisfied with your betting slip, you can collapse it again and continue adding additional wagers which will automatically appear on your betting slip. You can source the iOS app directly from the App Store. In fact, you are able to download the Tote iOS app by either searching for the app through your iPhone or iPad device or by searching for the app on iTunes from your Mac. Downloading the iOS app proves extremely easy and convenient as the process remains just like downloading any other app from the App Store. Simply search for The Tote within the App Store, select ‘Get’ and confirm you wish to install the app on your iOS device. The installation process will only take a few seconds, and once it is completed, you can access the Tote Mobile App by signing and with your login details, but only if you already registered an account on your desktop. If not, you also have the option to register for a new account, by following the same procedures used in the desktop version, within the iOS mobile app. When it comes to horse racing, punters will be pleased to know the Tote mobile app caters to all types of horse racing events, including those held in Nottingham, Cobourg, IGB Tralee, Parx Racing, Ballinrobe, and many others. Bettors can also take advantage of Irish horse racing and several other UK horse racing events through the mobile app. The mobile app will also come with additional features that are available on the desktop version, such as race times, various betting markets, betting amounts you wish to wager on the next upcoming race and line odds, ensuring you are well informed while on the move. Furthermore, the mobile app does not disappoint when it comes to betting markets, allowing you to select Exacta, Trifecta, Totals, and more. You can even view the horse races live within the mobile app, adding additional excitement to your betting experience while you’re on vacation or sitting at work. Both the iOS app and Android website version offered by Tote are bursting at the seams with innovative features to make your betting experience an unforgettable one while you’re away from home. You’ll be able to place a plethora of bets on both Irish and UK horse racing, greyhound racing, and football matches. The mobile apps will allow you to earn huge returns on small wagers and give you access to a unique variety of betting types on various horse races from across the globe. Furthermore, there are no account closures for successful punters with Tote or any restrictions for that matter. The reason being that Tote wants you to win and therefore eliminate the need to close any accounts and its indeed not necessary. You also won’t be limited to the size of your wagers, and you get to join an exclusive VIP Club that is jam-packed with sensational promotions and bonuses that you can claim within the app itself. If that’s not enough, punters can even stream most of the horse racing action that with a built-in video streaming feature to make each bet more captivating than ever before. The Tote mobile version of the site looks very similar to the mobile app found on the iOS devices. The top left-hand corner contains all the necessary links and features punters could possibly need, including horse racing, greyhound racing, football, tipster, guarantees and rollovers, fixtures and results, the Tote VIP Club, frequently asked questions, contact information, blog, about the company, betting types, and information about responsible gambling. What makes the Tote mobile version truly stand out is the fact that you can utilise the live chat facility directly on your phone or tablet without having to use the desktop version of the site. The layout comes across as neat, uncomplicated, and easy to understand. All upcoming races are well organised on the home page, with several more categories portrayed above the page in black and white for an added touch of convenience. You can also register through the mobile site or simply login with your existing account details if you already have an account. The overall experience remains smooth, reliable, and glitch free with no connectivity or lag issues of any kind. As previously mentioned, the mobile apps and the mobile version of the site appears very similar in layout and functionality, including how well organised everything on the site is, when comparing for differences between the app and portal formats on your mobile device. However, when it comes to mobile apps, you may experience a few problems, depending on where you are located in the world. For iOS users, the mobile app is not available in every country. You will need to have access to the Irish App Store to download the iOS mobile app successfully. Using the mobile portal eliminates all of these associated problems. You can just visit the Tote through a mobile web browser such as Safari, Google Chrome, Mozilla Firefox, or Opera, and everything works just perfectly without any additional downloads, adjustments, or requiring any other paraphernalia. Are there any mobile offers? Although Tote offers mobile apps as well as a mobile version of the site, unfortunately, no mobile specific bonuses or promotions specifically target those wishing to use their mobile platforms. Fortunately, you also can claim all promotional offers, available on the desktop version of the site, on your mobile device. The promotional offer for newly registered customers includes a €100 sign up bonus in intervals. This will see you receiving €10 back once you make a minimum bet amount of €10. This process continues until you receive the full €100 on your account. Once you have claimed the full €100, the Tote will refund you the average value of your initial ten bets up to a maximum of €40. Once the sign-up offer has been claimed in full, the Tote also offers monthly promotions and specials, being either sent to existing punters via email or it will reflect as a display directly in your account. Lastly, punters can also sign up at Tote’s VIP Club and receive a bunch of additional benefits, such as a dedicated account manager, price guarantees, money back on wagers, stable tours and exclusive events, racing tickets, and hospitability. If you are prepared to go through the hassle of downloading the Tote mobile app on iOS or use the mobile version, first ensure your mobile or tablet device meets minimum system requirements. The mobile app offers more convenience without any unnecessary headaches or irritations when attempting to place a bet. For Android users, the required operating system to successfully run the app on your mobile or tablet device involves all versions from Froyo 2.2 to Oreo 8.1 operating system releases. For iOS devices, please ensure your operating system shows at least version 9 of Apple’s mobile OS or better. When it comes to funding your account on the Tote website, punters will be disappointed to learn a minimal range of methods is available. The most comfortable and most reliable way is to register your debit or credit card on the site, once your account has been created. You will need to fill in your card number, name on its front side, expiry date, and security code to add it. The minimum deposit is €5.00, while the maximum deposit depends on the card provider. Apart from registering your Maestro, Visa, or Mastercard on the site itself, punters can also fund their account in a more traditional sense by sending cash or a cheque to the Tote located in Ballymany, Ireland. Bettors will need to provide account information and contact details when sending money directly to the Tote as well. Obviously, this is a far slower process and requires up to five days before funds reflect in your account when compared to merely registering a card on your account. The last option is to contact The Tote directly via telephone and provide your card details to make a deposit or withdrawal successfully. Please keep in mind however that the support staff at Tote is only available from 9:30am GMT up until the last race of the day. When it comes to withdrawals, the minimum amount is €5.00, while the maximum limit is €5000. Tote, considered the home of pool betting since the 1930s, registered in Ireland and a license obtained from the Gambling Commission of the United Kingdom, ensures fair play, trust, and guarantees reliability on all wagers placed with this renowned bookmaker. Co-existing with Tote pools provided within the United Kingdom since 2008, the bookmaker started accepting online bets from as early as 2005. Since Tote opened its virtual doors, it recorded multiple jackpots commonly shared between numerous winners over the years. One winner received a truly impressive payout during 1988 at the legendary Leopardstown raceway where one lucky bettor managed to walk away with an eye-watering £207,000 from a single ticket. Tote online offers international horse race betting from various destinations around the world, including Dubai, Hong Kong, the United States, France, the United Kingdom, and Ireland. Punters will be treated to Each Way betting, Place Betting, and Win betting as well as several unique tote wagers such as Scoop 6, Pick 6, Placepot, Jackpot, Trifecta, and Exacta which offer multiple opportunities to win both small and large stakes. The Irish Pick 6 is considered the flagship wager along with daily guarantees as well as regular six-figure rollovers, ensuring huge customer payouts quite frequently. Just to give you an idea, in 2017 the Tote Pick 6 pool managed to reach well over €900,000 at Punchestown Racecourse. Apart from horse racing, the site also accepts wagers on Greyhound racing, various football matches, and a host of other popular sports betting opportunities. In that review, we will talk about the mobile services of The Tote and the opportunities they offer to players. Can you contact support through mobile apps? Yes, you will be able to contact support via a live chat facility, or you can give them a call during office hours as all contact information is available within the mobile app on both Android and iOS devices. Are there any mobile-specific promotional offers? Unfortunately not, however, the sign-up offer and monthly promotions and specials will be available on the mobile apps for you to claim. You don’t need to visit the desktop version of Tote to view the latest promotions. Can I deposit and withdraw from the mobile app? A: Yes. However, you will only be able to make a deposit using a Mastercard, Visa, or Maestro. You will also need to use the same payment method when you request a cash-out. 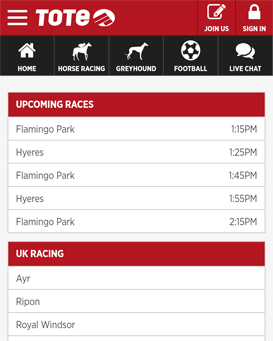 Can I view all upcoming horse races, greyhound, and football matches on the mobile app? Definitely. The mobile app designed offers everything featured on desktop versions. You can view all upcoming races and place an assortment of bets within the mobile app. Is live betting available through the mobile app? Yes. Punters will be pleased to know that live betting is indeed available on the mobile apps, giving you access to live streaming capabilities to add more excitement to your betting experience. Are all betting types available through the mobile app? Yes. Every betting type offered on the desktop version of the Tote also becomes available on the mobile app. You can place a bet via Trifecta, Win, Jackpot, and more. Does the mobile app provide guides to each betting type? Yes. Just like the desktop version, if you are not completely sure how a certain betting type works, you will be able to read through guides and tips that will allow you to understand the betting type before you need to place a bet. The Tote mobile app and site version for both Android and iOS is fantastic and provides you with everything required to successfully place bets, stay up-to-date with the latest news and fixtures, and comes equipped with an assortment of guides and betting advice. However, to get the app on your mobile device is a difficult venture as iOS users can only download the app if they are located in Ireland or the United Kingdom. Apart from these restrictions, the mobile app is a must-have if you do not feel like standing in queues at the racetrack, or while unable to visit the site via your desktop from home. Our rating for Tote mobile app – 8 out of 10.